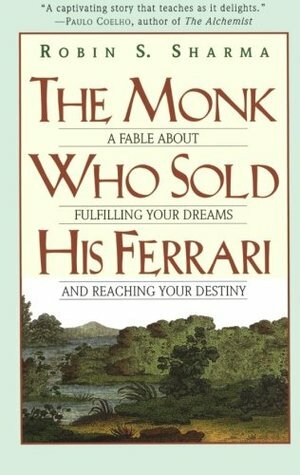 The Monk Who Sold His Ferrari by Robin Sharma is a self-help book. It is a story about how to fulfill one's dream, and the author shows a path to reaching our destiny. The main character of this story is Julian Mantle, an enormously successful lawyer. His outrageous courtroom theatrics regularly made the front pages of the newspaper. He suffered a severe heart attack in the court, and his life changed after that. He quit his job, sold all his belongings, and fly to India in search of Nirvana or true meaning of his life. It's a story about the transformation of 53-year-old Julian into a man who looks like 30 without any wrinkles on his face. Julian came to his country and met his old friend and colleague John. Julian shared his story and experience with his friend. Robin Sharma shows a path of enlightenment through seven timeless virtue and symbols. This story tells you how to master your mind, follow your purpose, practice Kaizen, live with discipline, respect your time, selflessly serve others, and embrace the present. The story has a single POV. It is slow paced, and a few times it makes me bored. The characters are a little bit dull. Julian is considered as a litigator while John just wants to understand the things his friend shared. This book fills with different example and stories to understand the meaning of life. Julian learned these things from the Sages of Sivana in India. The story definitely left an impact on readers. This book encourages you to follow your calling and do what makes you happy. It is a recommendable read. Find out what you truly love to do and direct all of your energy towards doing it. Once you do this, abundance flows into your life, and all your desires are filled with ease and grace. Never forget the importance of living with unbridled exhilaration. Never neglect to see the exquisite beauty in all living things. Today, and this very moment is a gift. Stay focused on your purpose. The Universe will take care of everything else. The Universe favors the brave. Freedom is like a house: you build it brick by brick. I am more than I appear to be, all the world's strength and power rests inside me. Robin Sharma is the CEO of Sharma Leadership International, a global training and coaching services firm. He is the author of 11 international bestsellers that have been published in over 60 countries and 70 languages. A highly influential blogger and social media celebrity, Robin is also a much sought-after speaker.